© 2019 Dr. G’s Brasshole All Rights Reserved Photos and names used with permission. The Arts and Crafts movement dates from approximately 1880- 1920. Reactionary to the Indus- trial Revolution, the movement emphasized handmade over mass production, with a focus on simple forms and clean lines, natural materials, and originality. Inspi- ration was taken from Shaker, Mission, and Japanese styles. Most popular from about 1890 - 1910, the Art Nouveau movement was inspired by natural forms and structures, primarily the curved lines of plants and flowers. Stylistic influences include Pre- Raphaelism, Arts and Crafts, and Japonism. 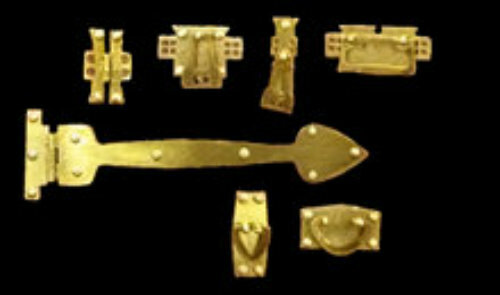 Solid, honest, hand-forged, and durable are words that define American 'Colonial' style hardware. Handmade by blacksmiths, American colonial hardware designs were as unique as the maker, and styles and motifs were influenced by the styles in the countries that they and their forebearers left behind. Typically dated from about 1700-1760, the American colonial style has had many revivals, and similar style hardware is in use even today. 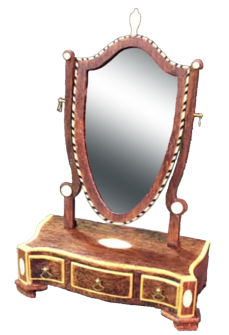 Considered part of the Victorian and Queen Anne styles, the Eastlake Movement dates from about 1870-1880 and was founded by Charles Eastlake, who felt that the furnishings and decor in people's homes should be made by hand or machine by workers who took pride in their work. The geometric design features (spindles, ornaments, relief carvings, and incised lines) were made to be reproducible, affordable, and easy to care for. 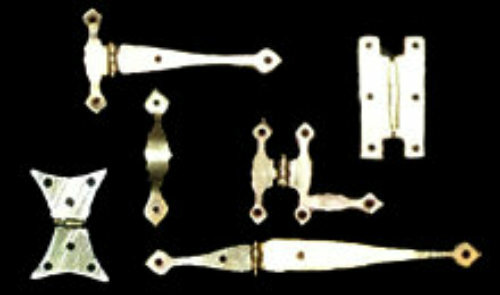 We offer a few types of fasteners, all in solid brass and custom- made for us and exactly in scale with our hinges and hardware. Precisely machined for a consistent size, our fasteners, screws, and bail posts look great when installed on 1:12 furniture because they are the right size and are uniform part-to-part. We now offer some of the unique tools that we realized we needed for ourselves but had a tough time finding: micro-tip screwdrivers that fit with our scale screws; tweezers with ultra- fine tips that fit through our bail posts; drill bits sized to match our fasteners and a pin vise that holds them tightly. We invite projects for custom work, and stand by our motto of 'by artists, for artists'. If you don't see some hinge or hardware in our offerings but can see the project in your mind's eye, that's reason enough for us to get started. Successful custom projects like the ones pictured here are something in which we take great pride. We would be pleased to help you create that unique, impossible-to-find, period-accurate hardware that would help your next project truly soar. Contact us to discuss bringing your vision to reality. 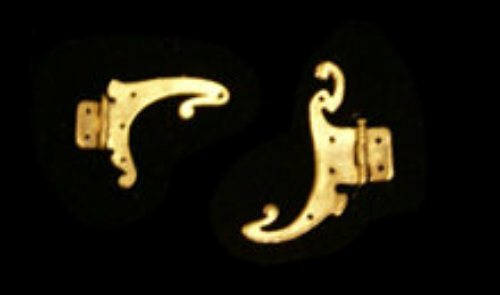 Designed for the scale miniaturist, our brass hinges are etched, hand folded, polished, and finished. our Etsy shop for prices and availability (link at bottom of this page). The Arts and Crafts movement dates from approximately 1880- 1920. Reactionary to the Indus- trial Revolution, the movement emphasized handmade over mass production, with a focus on simple forms and clean lines, natural materials, and original- ity. Inspiration was taken from Shaker, Mission, and Japanese styles. 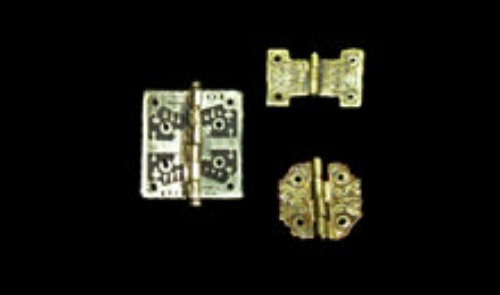 We offer a few types of fasteners, all in solid brass and custom-made for us and exactly in scale with our hinges and hardware. Precisely machined for a consistent size, our fasteners, screws, and bail posts look great when installed on 1:12 furniture because they are the right size and are uniform part- to-part. We now offer some of the unique tools that we realized we needed for ourselves but had a tough time finding: micro-tip screwdrivers that fit with our scale screws; tweezers with ultra-fine tips that fit through our bail posts; drill bits sized to match our fasteners and a pin vise that holds them tightly. We invite projects for custom work, and stand by our motto of 'by artists, for artists'. If you don't see some hinge or hardware in our offerings but can see the project in your mind's eye, that's reason enough for us to get started. Successful custom projects like the ones pictured here are something in which we take great pride. We would be pleased to help you create that unique, impossible-to- find, period-accurate hardware that would help your next project truly soar. Contact us to discuss bringing your vision to reality. busy working to perfect additional custom finishes/patinas. at bottom of this page).